With the Grand Canyon, Oak Creek Canyon, the Painted Desert, the Four Corners area and many other geographical wonders in the northern end of the state, southeastern Arizona, steeped in both natural history and human history, is often overlooked. But it is not to be missed! This was the home of Cochise. This was the land of Geronimo. This was the land of copper mines, silver mines, gold mines, Army forts, Indian wars, cowboys, cattle rustlers, gamblers, the Earp brothers and the Clantons and Doc Holiday. Southeastern Arizona was the quintessential Wild West. This place oozes with tales and legends and beauty. And it is all still here for us to enjoy. With summer temperatures much milder than many parts of the state, southeastern Arizona offers comfortable day trips into history and adventures not possible in some of the hotter desert areas. There is so much to see and do here, it is easy to find something to delight each member of the family. For the naturalist, birds abound, including some of the rarest and most beautiful in the United States. For the history buff, there is the Cochise Stronghold in the Dragoons, the site of Geronimo's surrender down near the Mexican border, and boom towns such as Tombstone and Bisbee to explore. There are hikes and picnic areas in national monuments that will take your breath away with their splendor. There are historic (and reportedly even haunted) hotels and "bed & breakfasts", as well as some of the best camping in the state. There are reenactments of the Shootout at the OK Corral, and there are overlooks that fill one with peace. There is something for everyone here. This is southeastern Arizona, Apache Country. The Apache were once a nomadic people. There are Apache reservations today scattered throughout Arizona, but the southeast corner of the Arizona was their home. After the arrival of the Spanish and their horses, the Apache people developed a rich equine culture. Horses allowed them a freedom to travel they had not known before, and they became excellent horsemen. The horse also allowed these people to fight for their land as the westward expansion took place, and fight for it they did. Cochise, perhaps best known for his desire to be a liaison between the two cultures, worked hard to secure peace, but peace was not to be had. It was not until Geronimo's surrender in the 1880s, also in this little corner of the state, that the Indian Wars finally came to a close. The story of the Apache is an integral part of southeastern Arizona's history, yet far more than that. It is part of this beautiful land, much of it still the way it was when the Apache lived here. And that beauty is something we can still see and experience for ourselves. 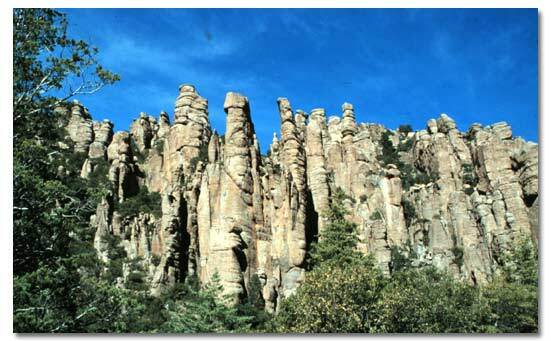 One of the most spectacular of all places to visit in this fascinating land is Chiricahua National Monument. With rock formations and pinnacles that seem to defy gravity, this is a must for anyone visiting the area. About 27 million years ago, this "Land of Standing-Up Rocks" was formed when a violent volcanic eruption spewed forth thick, white-hot ash. This eruption was a thousand times greater than the 1980 eruption of Mount Saint Helen in Washington. As the ash cooled, it fused into an almost 2,000-foot thick layer of volcanic rock known as rhyolite. 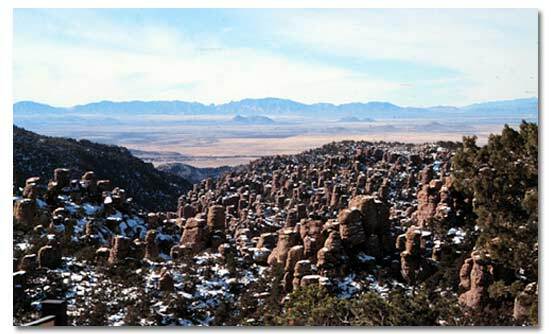 The Chiricahua Mountains were created as well during this time. Over the eons, wind, water and ice sculpted what are today the formations that make up Chiricahua National Monument. This incredible area offers some of the most amazing geologic formations that can be seen anywhere in the world. The Ranger Station and Visitor Center are just inside the park entrance. From there, a beautiful scenic drive that climbs gradually through oak, juniper and pine forests -- Bonita Canyon Drive -- winds 8 miles to the crest of the mountains and Massai Point. Picnic tables and restrooms are available here. Echo Canyon Trail and Heart of Rocks Trail offer fantastic views of balanced rocks, pinnacles and spires. The picturesque homestead of the area, Faraway Ranch, is open to the public with daily tours. And the monument's Visitor Center has an audio-visual program and exhibits, as well as books and maps for sale. There are hiking trails, both short loops and longer treks that take you back down the mountain and deep into the gorges and other splendors of this spectacular place. More than 20 miles of trails wind through the park. Duck on a Rock, Totem Pole and Big Balanced Rock are just a few of the more famous formations you will see. It is one of the few places where you can watch a hawk soar high on the wind.... below you! From Massai Point you will see Cochise Head, the incredible formation that appears to be the face of Cochise, prone and facing the sky above, beautifully sculpted from nature herself in a seeming tribute to the Apache people for whom this land was once home. A plethora of animals and birds can be seen in the monument, many of which are found only in this corner of the southwest. Javelina, Coatimundi, hog- nosed and hooded skunks, deer, bear, mountain lions, rare hummingbirds, Scott's orioles, painted redstarts, hepatic tanagers and red-faced warblers are just a few of the interesting wildlife species to be found in this fantastic land. 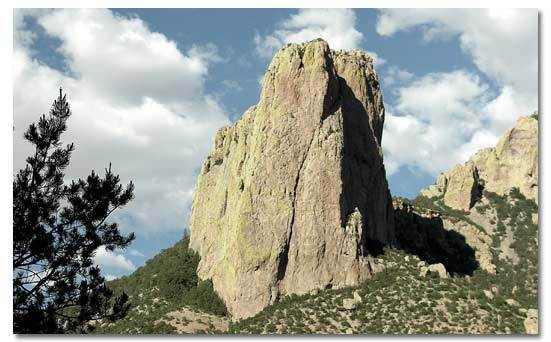 Chiricahua National Monument is located an easy 120 mile drive east of Tucson. Exit I-10 at Wilcox , and follow State Route 181 for 36 miles to the Monument. The story of the west and any tour of this area would not be the same, or complete without including the legendary town of Tombstone. The entire town is a National Historic Landmark, and much of the original buildings are still intact. There is something for every member of the family here in Tombstone. At first glance, it might appear that gift, book and curio shops are the main attractions, but if you take the time to stroll down the boardwalks, you will find yourself drawn into the past. Besides the OK Corral and the reenactments that take place in the outdoor amphitheater, there are both public and private museums, antique stores, the original Tombstone Epitaph newspaper print shop, and Boot Hill. 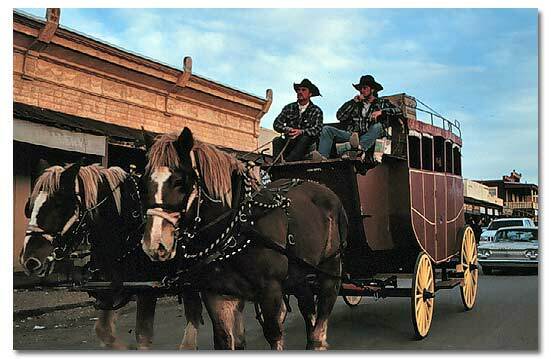 Vistors can pan for gold, horseback ride down trails once traveled by Doc and Wyatt, take a stage coach ride, tour the silver mines, stay at historic bed and breakfasts and attend the infamous Bird Cage Theater, where Tombstone's haunting and colorful past will take you back to its heyday. To truly appreciate all that Tombstone has to offer, park the car and plan to spend at least a day - taking a walk back into history. Bisbee, just east of Tombstone, is a picturesque and historic town created by its huge copper mine. Today, the historic Copper Queen Hotel is the center of town. It is surrounded by wonderful art galleries, local artisan's craftshops, and marvelous antique shops. There are tours and lookouts of the copper mine, offering many unique photo opportunities. Bisbee is in the mountains between Tombstone and Douglas and has pleasant summer temperatures. A day in Bisbee is a delight, and a stay at the Copper Queen Hotel a must. Bisbee is the county seat of Cochise County. A little known area, except by ardent naturalists, Cave Creek Canyon and Portal are located on the south side of the Coronado National Forest. This tiny town, with the Portal Store, a post office and library, has more to offer than a first glance would have you believe. This is truly Arizona's quiet little gem. Cave Creek Canyon is a mecca for birders from all over the world. The famous elegant trogan is a bird that is sought with binoculars by early risers carrying their Life List. This beautiful tropical bird comes into the United States only here in this little pocket, and its distinct call echoing throughout the canyons draws birders the world over. There are rare hummingbirds here as well, and just a stop at the Portal Store will allow you sightings of these beautiful little birds. Hummingbird feeders abound in Portal, set up by both residents and campers. Several kinds can be purchased here or at the Research Station just up the road at the end of the canyon. Scientists and biologists of world renown have left their mark here at the American Museum of Natural History's Research Station. Students come here to conduct research for their master's and doctoral theses, while scientists conduct important studies on birds, mammals, insects, reptiles, plants, ecology and geology. There are cabins available to those doing research, and a gift shop that is open to the public. Campgrounds are plentiful here for both tent and RV camping. There are year-round streams, spectacular walks and easy hikes. Sunnyflat Campground has a fantastic view of Cathedral Rock, Cave Creek's biggest landmark. For the adventurous, a dirt road leading over the mountains to Chiricahua National Monument can be traveled in the summer months. There is no end to the wildlife that can be seen here, and when hiking on the trails, there are often world-class experts on birds, insects, mammals and reptiles hiking with you, so don't hesitate to ask questions to the friendly passers-by. Portal is a unique and wonderful place, where the people are friendly, have an interest in the nature surrounding them and are not reluctant to share their knowledge. Be prepared to take a lot of pictures at Cave Creek Canyon. In this land of the Chiricahua, there are historical sites, forts, monuments, boom towns, streams, mountains, mines, and wildlife to be found in abundance. It would be impossible to cover them all in one article. Geronimo's surrender site outside of Douglas. (This is on a little-used dirt road which may require 4-wheel drive. Inquire locally for directions and road conditions). Remember, there is truly something for everyone here. Whether you are interested in natural history, Indians, the Wild West, or just want to shop for pieces of history, you can do it all here in southeastern Arizona! And with its milder seasonal temperatures, this region can be enjoyed year-round.